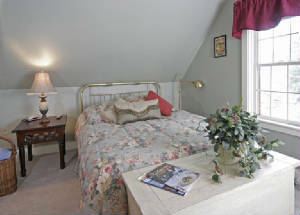 Named for the old New Haven Railroad facility that is near the end of the line in New Haven Connecticut, the Cedar Hill Room faces the front facade of the Inn and has a bit more space than the Haydenville Room. The upper photo here shows the beautiful queen sized brass bed along with a good sized night table, lamp and alarm radio. This bed has a brand new Englander mattress. 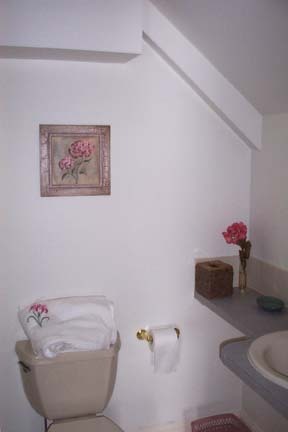 The upper right photo shows a bit of the bathroom. It doesn't however, show the newly constructed tile shower. 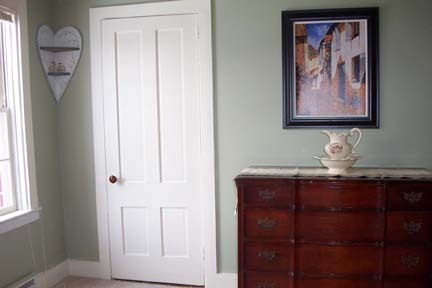 The bottom left photo shows a partial view of the antique chest of drawers and the adjacent, roomy closet.